Red2120's Club Penguin Cheats, Secrets, And Give Aways! : Halloween Contest Bug! Hello everyone! Theres currently a bug on Club Penguin! They will be getting it fixed soon! 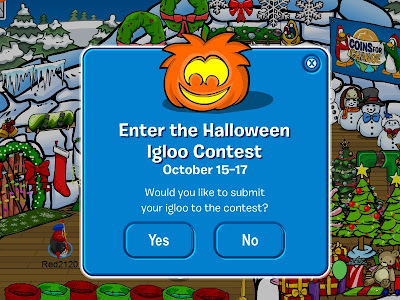 It says "Enter the Halloween Igloo Contest" But don't worry! They will get this fixed soon!